If you're looking to get your child excited about science, the answer could be right in your backyard. 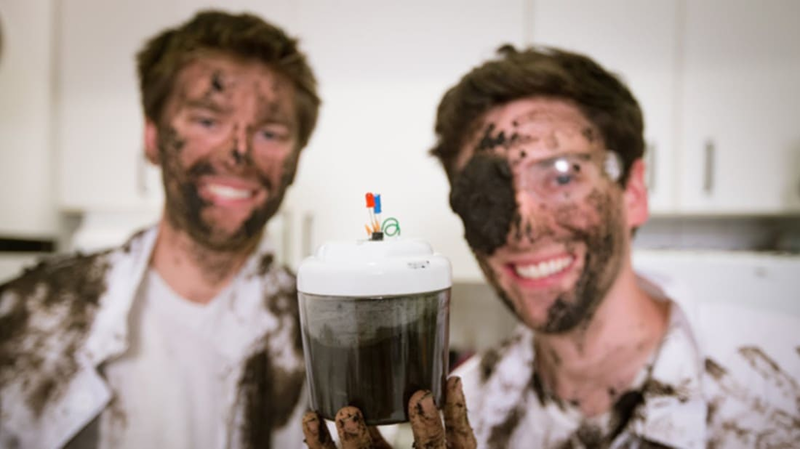 Keegan Cooke and Kevin Rand—a scientist and an engineer, respectively—have created awesome kits to make batteries powered by mud. MudWatt is an innovative approach to STEM (Science, Technology, Engineering, and Math) education that can also power your electronics. The batteries work by harnessing the power of bacteria that live in soil. These microscopic organisms release electrons as they consume and break down sugars. The MudWatt serves as a home for these microbes. As the bacteria expel energy, the battery will capture it and allow it to be reused. Two discs are placed in the battery: the anode (placed in the mud) and the cathode (placed on top, exposed to air). The microbes will release their electrons into the anode, where they will move up a wire and into the "Hacker Board." From there, they can power small electronics like a thermometer or alarm clock. Afterwards, the electrons make the descent back into through the wire into the cathode. Finally, the electrons mingle with the oxygen and create water. The cycle is continuous, and occurs trillions of times every second. According to MudWatt, the two most common types of bacteria are Shewanella and Geobacter. Shewanella can be found almost anywhere on earth, and can expel energy to compounds outside its body. Geobacter is most likely to be found where there is no oxygen (like the ocean floor) and can respire iron compounds.